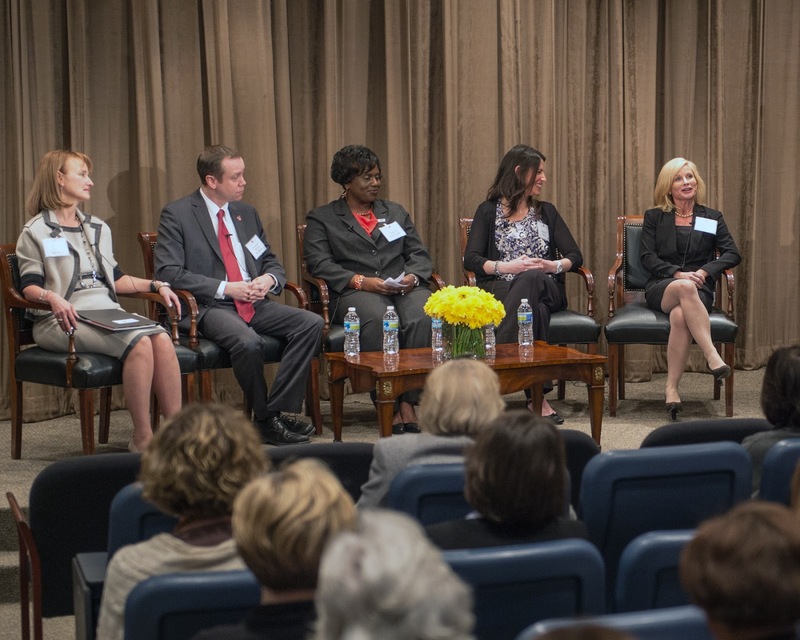 Ayers Foundation President, Janet Ayers was a panelist at a press conference for SCORE, on February 5th in Nashville. 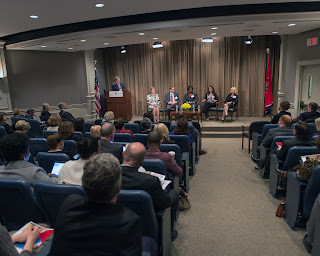 The conference discussed higher standards for teachers and was covered by Nashville area media. To read more, click the links below. Less than a week after state education officials linked better ACT scores to teacher effectiveness, an education advocacy group is calling for teaching candidates to face tougher academic standards before starting their own studies. The State Collaborative on Reforming Education, or SCORE, recommended on Tuesday that public universities and colleges raise standards for students entering teaching programs. The group also recommends tougher teacher licensing policies. SCORE noted that some schools admit and graduate teachers who scored less than 15 on the ACT college admissions exam — a score near the bottom of all students taking the test. The Ayers Institute for Teacher Learning and Innovation within Lipscomb University’s College of Education has secured a $1.2 million grant to improve teacher performance and student outcomes throughout Tennessee. The grant, announced Monday and secured from the Tennessee Higher Education Commission, comes on the heels of the institute's founding this past April. With the money, the Ayers Institute can create resources for university faculty to use when preparing new teachers to employ the national and state-adopted Common Core Standards. Previously, THEC highlighted Lipscomb in the 2011 Report Card on the Effectiveness of Teacher Training Programs as one of the state’s three top performing teacher preparation programs in that year. The THEC grant brings the Ayers Institute funding to $2.2 million to be spent over five years. The Ayers Institute has already hired a program director for Common Core programs and has convened a Common Core Advisory Board made up of representatives from higher education institutions throughout Tennessee. Candice McQueen serves as dean of LU’s College of Education and as interim director of the Ayers Institute. Less than four months after its establishment, the Ayers Institute for Teacher Learning and Innovation within Lipscomb University’s College of Education has secured a million-dollar grant to advance its mission to improve teacher performance and student outcomes throughout Tennessee. The Tennessee Higher Education Commission (THEC) has awarded a $1.2 million contract to Lipscomb’s Ayers Institute to create resources for university faculty to use when preparing new teachers to employ the national and state-adopted Common Core Standards. Previously THEC highlighted Lipscomb in the 2011 Report Card on the Effectiveness of Teacher Training Programs as one of the state’s three top performing teacher preparation programs in that year. The THEC grant brings the Ayers Institute funding to $2.2 million to be spent over five years. “The Tennessee Higher Education Commission is excited to partner with the Ayers Institute for Teacher Learning and Innovation at Lipscomb University on this important endeavor. This program will ensure that future teachers are prepared to help students learn on the first day in the classroom” said Dr. Richard G. Rhoda, executive director of the Tennessee Higher Education Commission. The Common Core Standards, now adopted by 45 states including Tennessee, are a set of academic standards developed by leaders in several states and endorsed by the federal government to ensure that every student graduates high school prepared for college or the workforce, regardless of the state in which they live. Tennessee schools began implementation of Common Core Standards in both math and English/language arts for grades K-2 in the 2011-12 school year. To lead this statewide effort to produce these models for the teachers of teachers, the Ayers Institute and Lipscomb’s College of Education, THEC and the Tennessee Association of Colleges of Teacher Education (TACTE) have selected representatives from higher education institutions throughout the state to serve on a 12-member Higher Education Common Core Advisory Board. The board, convened by the Ayers Institute, met in July to begin the development process. As with many of the Ayers Institute’s professional development products, the Common Core preparation programs will largely be full-length video modules that model Common Core lessons and are accessible for free online. The Ayers Institute will be one of the only resources in the nation offering such centralized information for teacher preparation with a facilitator’s guide for faculty and statewide training. Common complaints heard from teachers is that while resources are available on the Internet, there is no guarantee they are quality controlled and searching for them is too difficult and time-consuming to do on a regular basis. The primary mission of the Ayers Institute is to serve as a central clearinghouse of resources for teachers – one that ensures quality information and ease in navigation, said McQueen. The Ayers Institute plans to debut its first online professional development resources for teacher preparation programs in early 2013 with statewide training to follow. McQueen and the new Ayers Institute Program Director for Common Core, Jennifer Hill, are already intimately involved in helping Tennessee transition to the Common Core Standards. Both serve in the Educator Leader Cadre from Tennessee for the Partnership for Assessment of Readiness for College and Careers (PARCC) Consortium, a 23-state group working to develop national tests for students, based on the new Common Core Standards. By 2014, Tennessee students will no longer be filling in multiple choice bubbles on theTennessee Comprehensive Assessment Program (TCAP) Achievement Test tests, said McQueen. Achievement tests under the new Common Core Standards will be taken on computer and will require students to show more critical thinking, problem-solving and analysis with greater constructive response, she said. McQueen was also recently called on by SCORE (State Collaborative on Reforming Education), to participate in two conferences to prepare local educators and leaders for the transition to Common Core. She discussed how important the Core Standards are to Tennessee students and ways that higher education could partner with K-12 systems to support the work of raising academic standards. In April 2012, Lipscomb University, along with its partner the Ayers Foundation, established the Ayers Institute for Teacher Learning and Innovation, to serve as a clearinghouse for best practices in training teacher-leaders and school leaders who will positively impact student outcomes; for improving teacher practice through individualized professional development; and for developing innovative educational ideas. The Ayers Institute draws on knowledge gained by the Lipscomb College of Education in a nationally recognized individualized professional development program developed for Cameron Middle School in Nashville and other strategies developed for a variety of schools through Race to the Top funding. The College of Education launched the Ayers Institute with a $1 million gift from James and Janet Ayers through the Ayers Foundation. 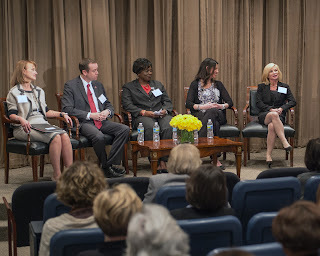 The primary goals of the Ayers Institute are to equip teachers with tools to improve classroom performance, to cultivate a statewide corps of principals and instructional teacher-leaders who promote a culture of effective teacher mentorship in the schools they serve, and to contribute expertise and proven change models to the dialogue on education reform. The Tennessee Higher Education Commission (THEC) was created in 1967 by the Tennessee General Assembly (TCA 49-7-202) for the purpose of coordinating and supporting the efforts of post-secondary institutions in the State of Tennessee. One of its statutory requirements is to create a master plan for the development of public higher education in Tennessee. The commission coordinates two systems of higher education: the University of Tennessee institutions and the state universities, community colleges, and technology centers. THEC’s goal for Tennessee's twenty-first century system of higher education is to elevate the overall educational attainment of citizens in the state through increased accessibility to institutions and to prepare citizens responsibly for success in the new century by providing high quality teaching and research in an environment that serves the needs of its consumers.